White rice is all well and nice, but what about a rainbow? This rainbow salad is chock full of exciting colours and textures and flavours – it’s like a carnival on your plate! 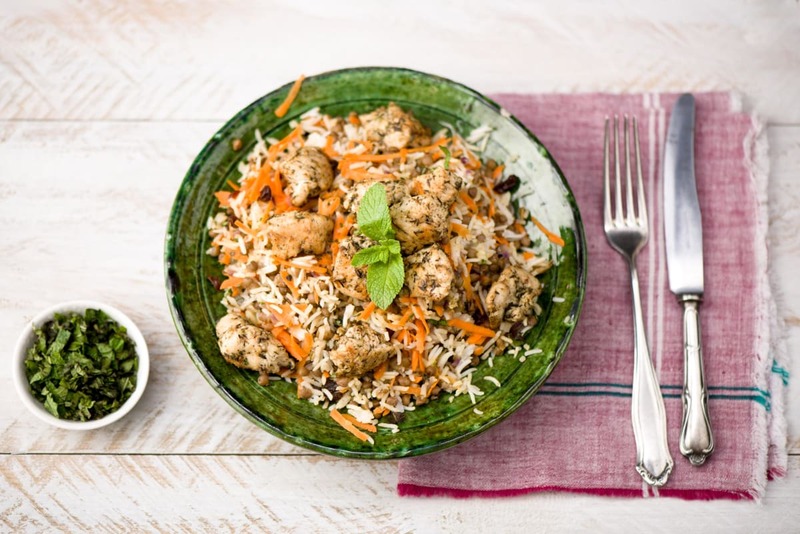 Herby, onion infused lentil and rice salad would be good with anything or even by itself, but when it gets together with caramelised pieces of za’atar-flavoured chicken, that’s when you’ve got a real party on your hands. To prepare the ingredients, dice the chicken breast fillet into 3 cm pieces. Finely chop the red onion and mint. Cut the lemon into wedges. Peel and crush the garlic, and peel and grate the carrot. Drain and rinse the lentils. Place the Jasmine rice into a sieve and rinse it with cold tap water. Rinse until the water becomes clear. Place rice and water in a medium saucepan and bring to the boil over a high heat. Cover with a lid and reduce the heat to medium. Simmer, covered, for 10-12 minutes or until the rice is soft and the water is absorbed. Meanwhile, toss the chicken breast pieces in half of the olive oil and the za’atar in a large bowl until well coated. Set aside. Heat the remaining olive oil in a medium frying pan over a medium heat. Add the red onion and garlic and cook, stirring, for 2-3 minutes or until the onion is soft. Add the lentils and rice and cook, stirring, for 1-2 minutes or until they are flavoured by the onion. Transfer to a large bowl. Stir through the carrot, currants, mint and squeeze the juice from half of the lemon wedges. Season to taste with salt and pepper. Place the same frying pan back on a medium-high heat. Add the za’atar coated chicken and cook for 3-4 minutes, turning occasionally, or until cooked through and caramelised. To serve, divide the rice and lentil salad between plates and top with the chicken. Serve with the remaining lemon wedges.